R&F Metals provides exceptional service and value for all your miscellaneous metal needs. The commitment to service and value is the foundation that the company was built upon and is present in every job R&F does today. 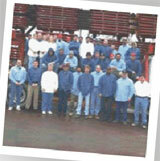 Ornamental railings and structural steel are considered the backbone of the operations at R&F Metals. With years of experience servicing the new residential market, R&F Metals has built an outstanding reputation. That reputation is based on delivering quality products on time and with fewer callbacks. for contractors, homeowners, and do-it-yourselfers.